Since most people start kicking their gift wrapping into high gear this month, I hope to bring you at least one new gift wrap idea per week from now until Christmas. Wrapping gifts has become one of my favorite ways to be crafty and I've already got some fun posts lined up over the next few weeks. I hope you'll join me! I've gathered up a few items to get us started. 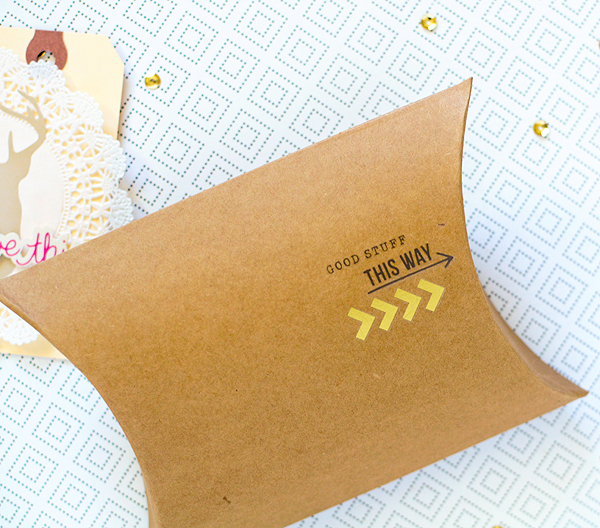 To achieve the basics of this little project, all you need is a plain box and some rub-ons. Though any style of box you have on hand will do just fine, I picked up a pack of 6 small pillow boxes from Target for a mere $1.50. When assembled, they measure 6 5/16" (L) x 4 1/2" (W) x 1 9/10" (H). That's large enough for a pretty scarf, some jewelry, a bottle of cologne, or 6 Hot Wheels if, like me, you have a car-obsessed little guy. I went a bit beyond the box & rub-ons (while remaining minimal), by adding some pink twine, gold glitter tape, and manila tags. 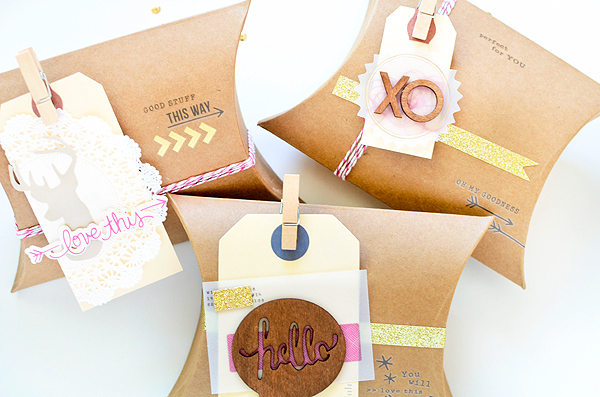 For the purposes of this post, I created a matching set and gathered just a few extra supplies to decorate the tags. 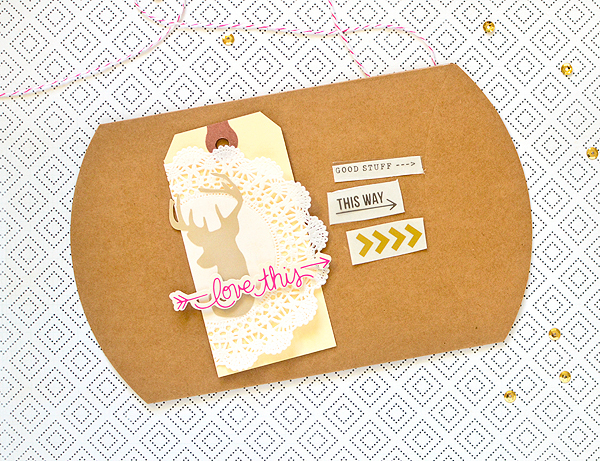 In keeping with the less-is-more theme, I made a rule that each tag could have no more than 3 embellishments. 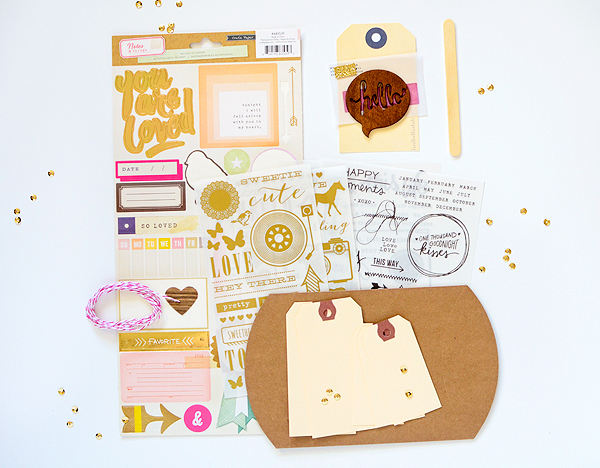 I chose the bright pink elements from Crate Paper's Notes & Things collection and paired them with dark wood and gold accents. The wood pieces come from all the way back to last Fall's Close Knit. After making my tags, I took a close look at the rub-ons from N&T. They are full of cute sayings and if you play around a little bit, you can cut and paste them together to suit your needs. 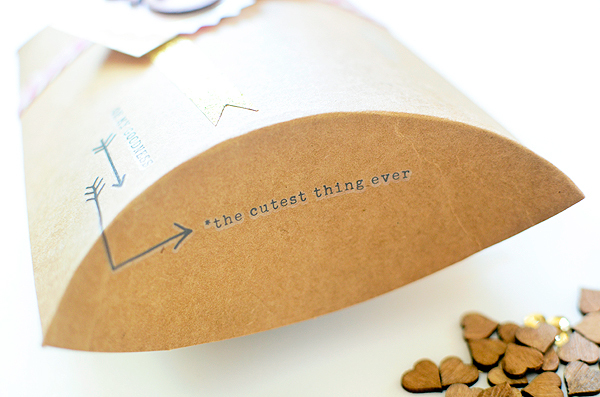 I really wanted to make the boxes appealing by creating a little excitement about the contents inside. Phrases like, Good Stuff, Love this, and Oh my goodness were exactly what I needed. If using a pillow box as I've done, keep it flattened while you apply your rub-ons. (This kind of box is really nice to use since it is flat and you can exert as much pressure as needed when applying your rub-on.) I trimmed the phrases I wanted to use from the full sheet and also trimmed off the white backing with it. This helps when messing about with placement, otherwise they may stick to your surface before you are ready to use them. 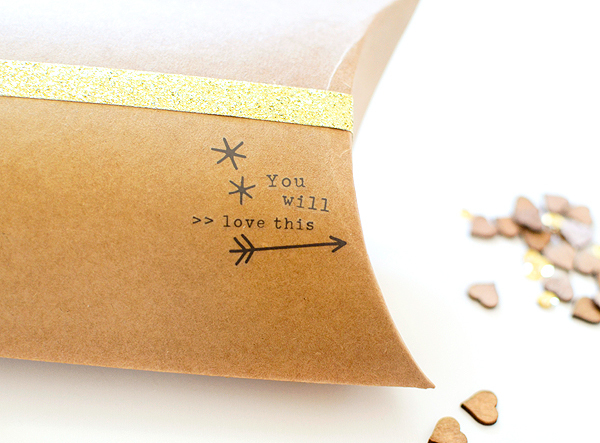 For this box, I liked GOOD STUFF ---> THIS WAY with the arrows pointing right. I also chose the brackets from a set of Styleboard rub-ons for a pop of gold. 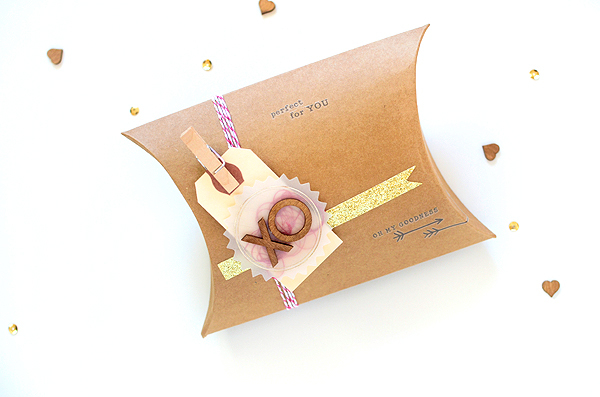 I actually made these packages with birthdays in mind, but it's great for holiday wrapping, too. 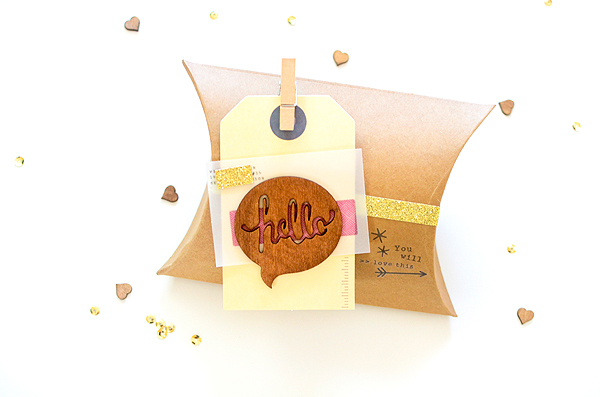 Since there is no added bulk, it is especially convenient if you have to travel with or mail your gifts. (You can either skip the tag or attach it later.) And if you switch out the pink details for red ones on this package in particular, it's all ready for Christmas. Thanks for checking in! 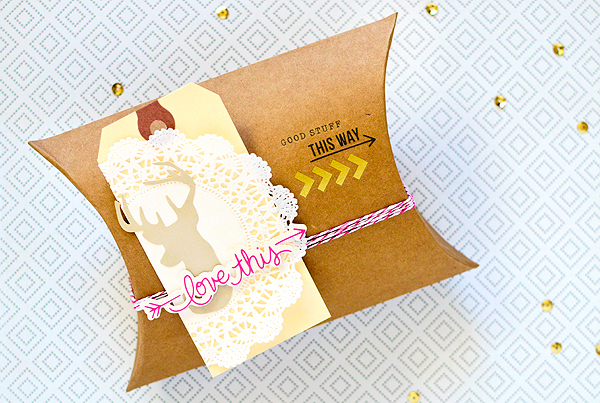 I'll be back next week with another fun gift wrap idea. Lovely lovely little boxes! Great idea. 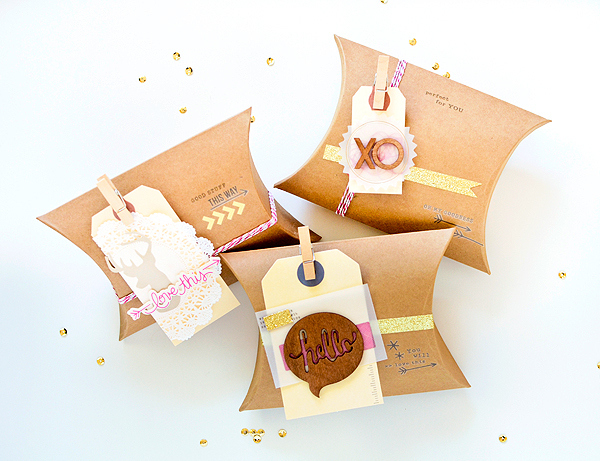 Such a fun way to dress up a little gift.